Lovely snippets there!! Thanks for visiting my blog - I'm following you back! Loving yourself is hard to do! 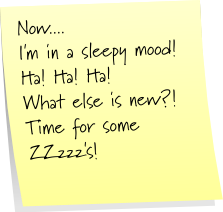 I feel you on the sleepy mood. I woke up at 2 to pee (the joys of pregnancy) and could not fall back asleep. Dropping in from TTT to just say hello, I'm already a follower! Very funny! I enjoyed stopping by. Hope you'll stop by my blog again and check out the Low Entry Lowdown (where you can find low entry giveaways from several different blogs) the Twitter Party Calendar, or any of the online freebies & deals posted. Wow 12 comments so far... thanks everyone. It's nice to see that people do love me!!!! I'm now following everyone that is new, and visited/commented on each blog. I found you on PINT. 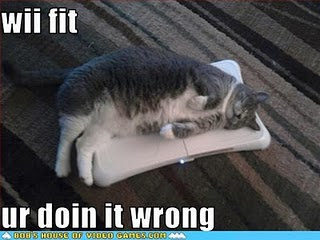 Gotta to say I love the Wii Fit pic. 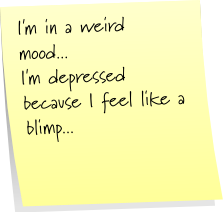 I feel like a blimp so I eat chocolate. 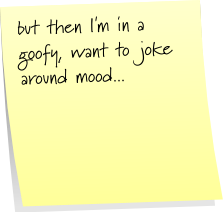 Then I feel like a fat failur so I eat more chocolate. Big, bad circle going here. Oh well, tomorrow is a new day. Following you back! Your blog looks very interesting. I'm eager to read more! Hey there! Following you back! The picture of the cat is just TOO funny! THanks for visiting peaceful divas!